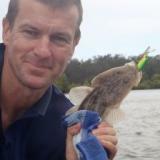 Heading up to the Nepean tonight with Daniel to camp and fish for the Bass Catch. The storms have made the river rise a little, but it still looks fishable and decent weather forecast, although not the high barometer, high temperature that we might like. Spent last night getting the fishing gear and the kayaks ready. An array of lures in boxes ready to go, including my new Tiemco Soft Cicadas. I bought these from Fish Head in Queensland, rang on wednesday, got them on thursday morning express post. Fish Head didn't charge me for postage as the order was close to $150. They also threw in a Fish Head branded sun balaclava. Excellent service! Hopefully we will have some good tales to tell about the cricket scores of healthy river bass we catch!